In my previous article I was taught you how to start a blog and I know for a blog or your any website or business, you need a logo and a banner, so in this article I will give you some awesome websites to create free logo and banner. If there is something important within the Branding is to have a logo, and the hand will need to create your custom banners to develop the brand. Create a banner or logo with an image editor is a simple task, you can even use tools very basic as Paint and then improve their design with other programs such as Photoshop. After completing designing work you will need to get traffic to your website and there is 12 killer tips to get unlimited traffic. The truth is that if you want your banners and logos have flash effect, you must use other more complex or resort to generators online tools. If you choose to create your logos and banners with any of the above programs, you only have to consider the measures, which are standard. Generators online banners and logos are based on precisely these dimensions, you will see the options shown and font color selection. That is, each site offers different options and, at the same time, various possibilities to create online banners and logos; as also can use a code generated in HTML to paste into your blog or web page will include eventually but not all advertising. Dimensions: choose between standard size or personalize it. Shape: horizontal, vertical, rectangular, square, etc. Source: the font and size of it. Colors: both the bottom of the banner to the text. Effects: shadow, gradient or moving. Borders: If you prefer, you can even do without them. Image format: png, jpg or gif. HTML Code: To copy and paste into your site. Needless to say, not all generators online banners and logos provide the above options, some are more basic in their functions and others let you create very professional designs; it's just a matter of taste and decide which best fits your needs. While Internet you can find dozens of sites to generate banners and logos online, I made ​​a list of which in my personal opinion are the best sites based on two key factors: ease of use and practicality. Opinions about the different generators online banners and logos are dissimilar course, there are those who opted to create our own designs with image editors and although not spectacular fulfill their function. As they often say, everyone likes. 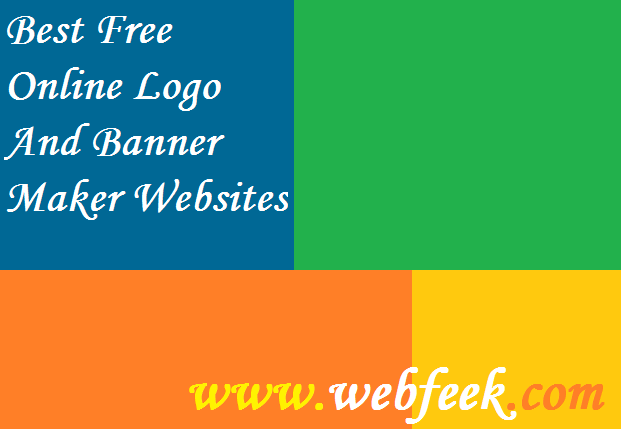 Additional Tip: You can also earn money by selling logos and banner for 5$ in fiverr. In next post I will show you how to register a .com domain at GoDaddy in less than $2. So keep visiting our blog or bookmark our blog with ctrl+d...!! !